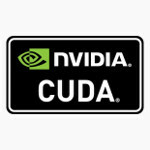 CUDA is like OpenCL, but only works on NVIDIA hardware. NVidia hardware, being GeForce GPUs, Tesla accelerators and Tegra mobile GPUs. It works with CPUs using a special compiler. AMD has made a tool to convert CUDA-code to work with their hardware.